Big Red, Brew Crew, Continue to Roll ~ The Bucky Channel - The World of Sports from Wisconsin's Perspective. You can't not be impressed with the month Seth McClung has had since he's joined the Brewers starting rotation. He's still working up that pitch count of his, but tonight when a season high 6 2/3 innings. 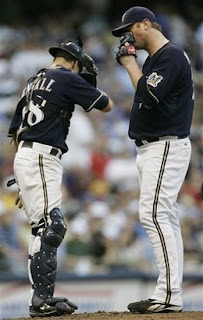 In that stretch, he gave up two runs, earned 6 K's, and picked up the win as the Brewers edged the Orioles 3-2. It was a nice bounceback for the Brewers after losing a tough one to Baltimore on Friday night. A Prince Fielder RBI got the game started in the first, and Corey Hart followed with a 2 run shot in the 3rd. That would be all the Brewers would need on offense, as they won another nailbiter, and Salomon Torres picked up his 11th save of the season. Couple of other notes from this one: Not sure what happened to Brian Shouse in the 8th inning, as he went from wind-up to the splits while getting the strikeout to end the inning. He limped off the field, but seems to be ok. I'd imagine he gets the day off tomorrow.... Rickie Weeks is back on the 25 man roster after being activated from the DL. Hernan Iribarren was sent back to Nashville to make room for Weeks. I don't know about you, but I was starting to get used to the idea of Craig Counsell as our everyday second basemen... Gabe Kapler started again in center for Mike Cameron, going 2 for 3.